AirPlay and iTunes let you stream music to multiple devices simultaneously. This means you can have the same music playing on your desktop computer in sync with devices in other locations, like an iPhone or iPod touch connected to a speaker dock, an Apple TV in the living room, a media center running XBMC, or even another Mac or Windows PC elsewhere on the network, so long as that computer has an AirPlay receiver app running on it. If you don’t have an AirPlay receiver like an Apple TV but still want to try this, consider downloading an app like Reflector or XBMC. Reflector has a free trial and allows for mirroring, and XBMC is free, functions as a full fledged media center, plus it works on Macs, Windows, Linux, Raspberry Pi’s, Android, and more. Either app will work for the purposes of functioning as an AirPlay receiver, and either will accept the music stream from iTunes. For the most interesting results, have more AirPlay receivers available. “Computer” is the local machine, keep that checked unless you don’t want the computer running iTunes to play music too. Other machines will be listed by their hardware ID or sharing names. Note that you can adjust the volume independently on each of the AirPlay receiving devices, meaning you don’t have to walk around to different rooms to adjust volume levels if you don’t want to, since the AirPlay feature of iTunes will let you control them all from a single location. Music should play perfectly in sync everywhere, giving you a house-wide surround sound stereo system. If music is slightly off it will usually resolve itself fairly quickly, but sometimes bad wi-fi signals and connections will continue to have issues until an underlying network problem is addressed. This will stop the music playing on the computer, and instead send it to only play at the receiver. Outside of iTunes, this can also be done directly from the Audio pulldown menu in OS X. This is a really great feature to use for parties and social gatherings, or if you’re just doing work around the house and want to have the same music playing everywhere. I’ve even seen some creative uses where a variety of AirPlay receivers are placed around a room to create wireless surround sound for video, since the streaming works for all types of audio including movies. This AirPlay integration appears to be new with iTunes 11, don’t be surprised if you can’t find it in earlier versions. Airplay has been available from iTunes for many version prior to 11. The new version makes it easier to find, but it’s been there for ages (far from new – at least 2 years). 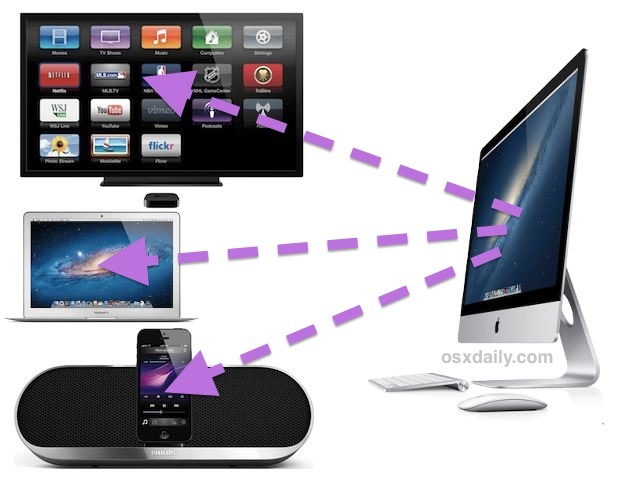 Can you explain how you stream music from iTunes on the Mac to an iPod/iPhone speaker dock? Are you talking about using other 3rd party apps on your iPhone or Mac? I’ve never used AirPlay. I’m old fashioned and still play my music from CDs. I now just pop a CD in the DVD player and start playing music. I don’t want to wake my Mac, log on, start iTunes, start AirPlay and then select the music I want to listen to. Once AirPlay is enabled can I just start playing music from my Mac while it’s asleep (using PowerNap) and select the music I want to listen to without touching the Mac again? If this is not possible I’ll just continue to play CDs on the DVD player. The living room is where I want to start playing music and selecting music. I don’t want to walk to the Mac (and wake it an log on, etc.) every time I want to play music or want to play another song. Am trying to use airplay to stream video to my monitors using raspberry with xbmc.I can do it easily with itunes for one monitor,but i want the same video to be streamed simultaneously to all my monitors. When i try to do this with music,i can use that “Multiple” choice,and i works fine. But with videos i can seem to find it..Is there any way to do this with airplay?